I figured this deserved it's own thread due to the fact that outside of the game being played in East Rutherford at MetLife Stadium, Jersey City is getting the lions share of the Super Bowl activities and festivities for New Jersey with Jersey City really taking center stage aside from Manhattan. The Pro Football Hall of Fame exhibit at the Liberty Science Center, renaming of Columbus Drive to "Super Bowl Drive" for the week of the Super Bowl, the Seahawks staying at the Westin and Broncos staying at the Hyatt respectively, Broncos and Seahawks having most of their media interviews aside from media day on a yacht docked in JC, Jersey City Super Fashion Week, Hudson Super Restaurant Week, and to really kick the Super Bowl off, Jersey City will host the Super Bowl Kickoff Spectacular at Liberty State Park with Daughtry, the Goo Goo Dolls, and the Fray performing and Joe Buck and Erin Andrews hosting! Jersey City pulling out all the stops to make the NFL feel right at home! JERSEY CITY — The vintage uniforms and old equipment provide a glimpse into football's history, but the game's evolution really hits home when you stand inside -- yes, inside -- a mold of retired running back Jerome Bettis' right leg. Bettis' tree-trunk thighs are placed alongside molds of the legs of Gilbert Brown and Leonard Davis. A few yards away, the models of the arms -- and bulging biceps -- of Bern Brostek, Irv Eatman and Cortez Kennedy are equally breathtaking. "These really show you how big football players are," exhibit developer Andrew Prasarn said with intended understatement. The only response is "Wow." The molds and models are featured in "Gridiron Glory," an interactive exhibition that opened Saturday (Sept. 28th) at the Liberty Science Center in Jersey City, where it will be on view through the playing of Super Bowl XLVIII on Feb. 2 and closing in early March. Hoping to catch the football fever infecting the metro area this fall, Liberty Science Center presents a touring exhibit from the Pro Football Hall of Fame that its staff has jazzed up with an interactive gallery that allows visitors to test their abilities to jump, kick and throw. "These are tests (footall players) do at the combine," Prasarn said, referring to the workouts that measure the skills of potential pros before the draft. "Kids can test their own skills." 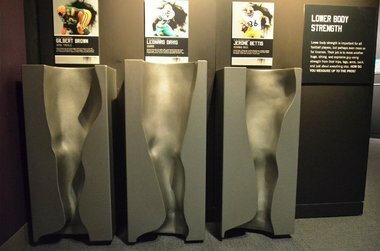 Casts of the actual legs of professional football players illustrate just how big and strong the players are. There's something for every football fan. Cases from the Hall of Fame chart the history of the game through artifacts including a 100-year-old leather helmet and early versions of the football itself. Among the hundreds of items are a Tiffany's-crafted Vince Lombardi Trophy, a 1917 game ball used by Jim Thorpe, the jersey that was cut off Matthew Stafford during a 2009 game when he separated his shoulder (and then went back on the field and threw another touchdown pass). "This is the first time many of the artifacts are being shown to the public," Prasarn said. "This is a unique opportunity." One exhibit focuses on technological breakthroughs, including ones that failed, while another examines the broader cultural implications of the game, such as efforts to integrate African-Americans into the previously all-white league. Interactive stations pop up through the galleries. Guests can wear the wired helmets that quarterbacks use to hear audio instructions from the sidelines and they can try on modern-day shoulder pads to gain an understanding of technological improvements to the game. In the "Science of the Game" gallery, videos show NFL players performing drills and experiments that break down the science behind their skill. There's even an instant-replay booth, a replica of the one NFL referees use to review plays that are in dispute. "Everybody's always screaming at the refs," Prasarn said. "This gives you a chance to try it yourself." The galleries are filled with the famous and the obscure, with records that still stand and artifacts from games that are still revered. There's a homage to the dynasties -- the teams from Dallas and Pittsburgh and Chicago who dominated their eras. A hometown heroes section honors the legacies of the Jets and the Giants. The science center has augmented this section with items on loan from the teams. During the run of the exhibition, Liberty Science Center will present a roster of former players from the Giants and the Jets. Brian Saxton, Bruce Harper, Bart Oates and George Martin are among the guests who will work in the Training Camp gallery, or assist with science experiments in other exhibitions throughout the museum. A list of the dates and players can be found here. Last edited by JCMAN320; January 23rd, 2014 at 02:16 PM. Christopher Columbus Drive Becoming Super Bowl Drive!!! Jersey City is firing on all cylinders to amp up local anticipation for Super Bowl XLVIII, including a huge, colorful mural painted by a local artist that residents and tourists alike will be hard pressed to miss. The mural, at a construction site at the intersection of Columbus Drive and Marin Boulevard, displays ”Jersey City Welcomes Super Bowl XLVIII” in bold, silver block letters, surrounded by images of footballs, NFL logos, the Jersey City skyline and the Vince Lombardi Trophy reminiscent of urban street art. Abdul Gonsalves, better known by his tag name “Paws21,” said he was commissioned by the Jersey City Mural Arts program to paint the large-scale piece, and although he’s not a football fan, his love of art trumped his non-interest in the sport. “This is my passion first and foremost. If I didn’t love what I did, I don’t think the work would come out the way it’s coming out,” he said. Gonsalves, a Jersey City resident who runs a full-scale art studio in Paterson, said the mural, which spans a long stretch of a wall barricading the site of an in-progress 50-story residential tower at 70 Columbus Drive, was an obvious way to welcome fans, as well as players and team staff who will be staying at hotels in the city. The painting was a one-man job aside from an assistant he hired to grab brushes for him and other simple tasks. The mural took roughly a week and a half, or 30 hours, to complete. He said he used an unorthodox method utilizing a combination of water-based acrylics and airbrushing due to its efficiency and because spray paint is often messy and can reduce the health of those nearby. Gonsalves said he’s received a lot of positive feedback on the piece. He even received a few requests for work from different organizations shortly after it was completed, he added, including interest from Jersey City, which was quick to have him paint another mural at 2nd and Washington streets, and have since contacted him for three more murals. For about a week starting Jan. 26, Columbus Drive in Jersey City will be renamed “Super Bowl Drive,” thanks to the City Council's unanimous vote last night. Though the Feb. 2 Super Bowl will be played at MetLife Stadium in East Rutherford, the two teams’ players will be housed here in Jersey City, at the Hyatt Regency and Westin hotels. The nine-member council approved the street renaming at its regular meeting last night. Columbus Drive will be Super Bowl Drive from Jan. 26 to Feb. 3. Officials with the NFL and the Super Bowl’s host committee spoke prior to the vote last night to council members, who Council President Rolando Lavarro thought were too low-key considering the topic at hand. Last edited by JCMAN320; January 31st, 2014 at 12:39 AM. “You can’t miss it; take a left off Marin Boulevard, onto Super Bowl Drive….” Don’t be astonished if you hear something like that between January 26 and February 3. By a unanimous City Council vote last Wednesday night, Christopher Columbus Drive will be temporarily renamed for the lead-up to the big game. On Sunday, February 2, the Denver Broncos and Seattle Seahawks will meet in Super Bowl XLVIII at MetLife Stadium in East Rutherford. And though the Giants and Jets fell short of the playoffs this season, Super Bowl Week will have many local connections, with Jersey City a major part of the action. Most notably, both teams will be staying in Jersey City hotels: the AFC champion Broncos at the Hyatt Regency, and the Seahawks representing the NFC at the Westin. Banners hung along “Super Bowl Drive” will greet players to town as they arrive via charter bus from Newark Liberty International Airport. Jersey City, in conjunction with the Hudson County Chamber of Commerce, will host welcoming events at both hotels, which will be open to the public. Dates and times for these events are still to be determined, but last year, the San Francisco 49ers arrived in New Orleans on Sunday night a week before Super Bowl XLVII, while the Baltimore Ravens got into town on Monday afternoon. The Westin and Hyatt events will feature live music, hot chocolate, and activities for children. Jersey City will also be home to the first-ever Super Bowl Kickoff Spectacular Concert. Tickets were free, and “sold out” very quickly. The event—beginning at 7:30 p.m. on Monday, January 27, at Liberty State Park—will include musical performances from Daughtry (led by the American Idol alum), ’90s alt-rock heroes Goo Goo Dolls, and more. Joe Buck and Erin Andrews from FOX’s sports crew are hosting the show. For those who did obtain tickets, do not bring large bags, backpacks, alcohol, coolers, or strollers into the park. For those not attending, portions of the show will be broadcast live on FOX Sports 1 from 8:00 to 9:00 p.m. And, due to inability to collect tickets for the sky, most in town should be able to catch a glimpse of the Macy’s Fireworks which will conclude the concert. The display, launching from a pair of barges on the Hudson River, is scheduled to begin at 8:45 p.m. Earlier on Monday the 27th, the NFL student diversity program “One World: Connecting Communities, Cultures, and Classrooms” will stage a special event at the Liberty Science Center. Through the program, fifth graders from ten different New Jersey and New York schools—covering a wide range of ethnic and racial backgrounds—have been communicating via pen-pal notes. During this three-hour “Super Huddle,” the students will meet in person for the first time. Science and culture workshops are planned, and the children will also get to interact with NFL players. Though no Jersey City schools are participating in the Science Center event, local children will still benefit from Super Bowl XLVIII. The Snowflake Youth Foundation—the charity wing of the NY/NJ Super Bowl Host Committee—recently donated $180,000 for new, energy-efficient lighting at Jersey City’s Ed “Faa” Ford Athletic Complex at Caven Point. Overall, a $1 million grant from the NFL Foundation, matched by the Host Committee, is funding a variety of projects throughout New Jersey and New York to keep children healthy and active. Even sports-shunners will have a hard time avoiding gridiron references during the upcoming fortnight. Jersey City Fashion Week is presenting… you guessed it… Football Fashion Week from January 23–25. Events include an opening gala, emerging designer show with NFL veterans on the runway, and a cognac tasting. Meanwhile, Hoboken’s Barsky Gallery (49 Harrison Street) hosts “Art’s Salute to Football” from January 25 to February 8. On display: ordinary footballs transformed into objets d’art via surprising enhancements and adornments (including one piece created by former New York Jets linebacker Aaron Maybin). “It is such a pleasure to showcase the work of talented local artists,” said gallery owner Al Barsky. Some proceeds from both the fashion and art events will benefit the Snowflake Youth Foundation. For those seeking fine dining—and Super soup bowls—15 Jersey City restaurants will be extending Hudson Restaurant Week through February 2. The eateries are offering lunch and dinner specials; tailgating is likely frowned upon. With all the different events and the expected influx of fans and curiosity seekers, Jersey City is certainly stepping up its readiness. Tuesday, January 21nd, the city’s Department of Public Safety—along with the Office of Emergency Management—will hold a preparedness exercise. The goal is to have established responses for any situation that might arise during Super Bowl Week, be it law enforcement or a weather event. United Water, PSE&G, and business owners will also be in attendance. “We have the responsibility of ensuring the safety of our residents, the teams, and all visitors to our city,” said Mayor Fulop. Along the same lines, earlier in the month Jersey City sponsored a Human Trafficking Awareness Symposium. The focus was on educating hotel staffers and public safety personnel about warning signs of individuals forced into prostitution. While this may strike some as random or excessive, similar awareness efforts have taken place in the past few Super Bowl host cities. The underlying idea is that massive crowds that are primarily male are viewed as ideal locations for such illicit activity. Whatever the case, many extra people are definitely anticipated in town. 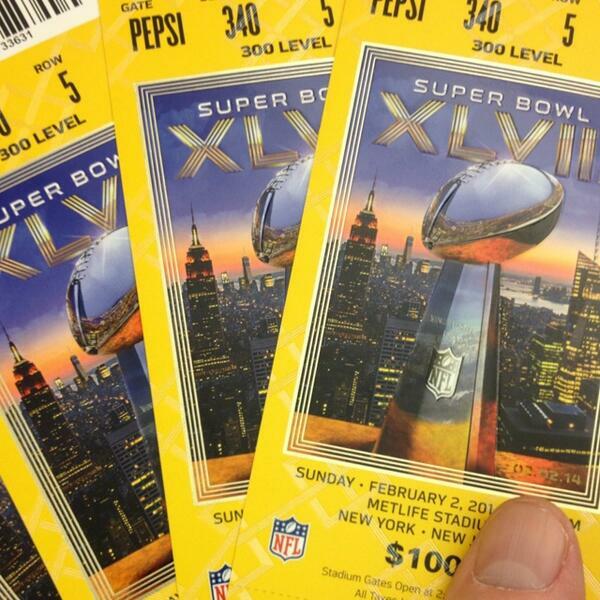 Estimates are that the Super Bowl will bring 400,000 visitors to northern New Jersey. In what’s being dubbed the first “mass transit Super Bowl,” local rail, bus, and ferry services are planning for the sudden spike in passengers. The PATH system, projecting a 20-percent rise in weekday ridership during Super Bowl Week, will increase off-peak frequency on the Newark-World Trade Center line starting January 27, and on both 33rd Street lines beginning January 29. Overnight service on all lines will be increased for the full week. One has to imagine that the Broncos and Seahawks won’t be taking public transportation from Jersey City to their practice facilities in East Rutherford and Florham Park, or to the big game itself. But keep an eye out for those luxury charter buses along Super Bowl Drive as you take in a week’s worth of events, activities, and revelry. (Visit the online Hudson County Huddle Zone for further details and updates.) Alternately, lock yourself in your apartment until it all blows over. Last edited by JCMAN320; January 23rd, 2014 at 12:55 AM. The NY/NJ Super Bowl Host Committee will herald Super Bowl week on Jan. 27 with a music and fireworks show in Jersey City. Goo Goo Dolls and Daughtry will play the Super Bowl Kickoff Spectacular at Liberty State Park, the committee announced today. A 13-minute fireworks display, from Macy's, will be set to a soundtrack with music from Bon Jovi, Bruce Springsteen, Alicia Keys, Lady Gaga and halftime performer Bruno Mars. Hosting will be Joe Buck and Erin Andrews, as well as Jordin Sparks, whose father, Phillippi Sparks, played for the Giants. Part of the show will air on Fox Sports 1 from 8 to 9 p.m., then repeat at 2 a.m. The show opens at 7:30 p.m (doors 5:30) and runs until 9 p.m. Though the event is free, a ticket is required to attend. They're available at sbkickoffspectacular.com, along with VIP tickets, which grant a reserved spot to see the fireworks and access to a "Host Committee NJ Warming Lodge" in Maritime Parc restaurant, which will have food and drink. Those tickets are $40. Parking passes are also required for cars; big bags, strollers and coolers are discouraged. Looks like the Denver Broncos will have a little piece of home representing them at Liberty State Park Monday night. Denver band The Fray has just been added to the Super Bowl Kickoff Spectacular in Jersey City. The band also joined the Broncos for the AFC Championship Game against the Patriots last Sunday. Previously announced performers at the Liberty State Park show are the Goo Goo Dolls and Daughtry. Jordin Sparks will help host the kickoff event as a correspondent at Macy's Herald Square — the show features Macy's fireworks. The NY/NJ Super Bowl Host Committee also announced that more tickets — both free tickets and VIP tickets that cost $40 — are being made available, due to high demand. The event sold out last week. Prior to the announcement, The Fray were already part of Super Bowl week. They're on the lineup for the NFL On Location pre-game party at the Izod Center on Feb. 2. Also playing that party are Cyndi Lauper and Doug Flutie. 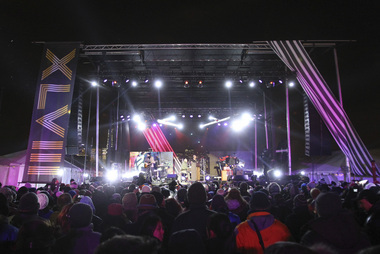 The Super Bowl Kickoff Spectacular is 7 p.m. Jan. 27 at Liberty State Park, 200 Morris Pesin Dr., Jersey City. Tickets are at sbkickoffspectacular.com. The VIP tickets include a reserved viewing spot for the show and fireworks as well as access to a pre-concert warming lodge at Maritime Parc Restaurant. For those not wanting to venture outdoors that evening, portions of the show will air Monday at 8 p.m. on Fox Sports 1 and repeat at 2 a.m. Tuesday. Planning to attend the kickoff concert? Let us know in the comments below. Last edited by JCMAN320; January 31st, 2014 at 12:40 AM. Not sure about Jersey City being the main attraction but they have really started carving up Broadway this morning. From 34th going north they are lifting all the Citibike racks and running cables all over the place. Next week there is a sort of week long tailgate taking place all along this area of Broadway. I have a view of it from my window. However most of the Super Bowl activities and festivities are happening in New Jersey . The Pro Football Hall of Fame museum and Exhibit is at the Liberty Science Center in Jersey City, Christopher Columbus Drive will be renamed, with NFL and JC Officials holding a ceremony, "Super Bowl Drive" for the week of the Super Bowl with banners welcoming the teams and fans to Jersey City along the Drive, the Broncos will be staying at the Hyatt and the Seahawks will be staying at the Westin and there will be festivities open to the public welcoming both teams at both hotels, they will practice at the Giants and Jets HQs and practice facilities located in East Rutherford, NJ, next to MetLife Stadium, and Florham Park, NJ respectively, the Super Bowl Kickoff Spectacular Concert will take place in Jersey City at Liberty State Park, the official Media Day will happen at the Prudential Center, home of the New Jersey Devils, in Newark, NJ with four day press conferences happening on a 45,000 sq. ft. luxury yacht docked next to the Hyatt in Jersey City, and finally the game will be played at MetLife Stadium in East Rutherford, NJ. In my opinion this is truly a NEW JERSEY and NY Super Bowl. Camille Cerria has never been so excited about football. Correction: Before now, the nautical event planner has never been excited about football. All that changed when her Hoboken-based company, Smooth Sailing Celebrations, was chosen by the NFL to host four days of Super Bowl press events aboard its spectacular Majesty yacht, which is billed as the largest party boat in the country. "I think (the NFL) really wanted a unique venue and there's no more unique venue than a boat," said Cerria, whose company is marking its 10th year in business. "Especially this boat, because of the atrium-style ceiling and everything else that it has to offer." The 45,000-square-foot Majesty boasts tremendously high ceilings and each of the four decks has an immense amount of open space filled with elegant tables, fireplaces, a cocktail bar, and even a working elevator. Cerria called that a perfect fit for the NFL, which hasn't provided many details but will be using the Majesty from Jan. 27 to 30. She said the yacht will be docked in front of the Hyatt in Downtown Jersey City, where one of the Super Bowl teams will be staying. "Without this boat, it would have been impossible," Cerria said. "Their criteria was so specific regarding the space and height they needed, there was only one boat." Having the perfect venue -- with a perfect view of the New York skyline -- was half the battle, Cerria said. The other half is knowing the right people. Her company has a strong relationship with the Westin in Downtown Jersey City, which will host the other Super Bowl participant. She was referred by officials there to the NFL and the rest, she hopes, will be Super Bowl history. "Relationships are really important in this business," she said. "I advertise, I market, I network, and that's all well and good, but I think that the relationships that we have are really what make our company what it is and what really drives business to us. "Word of mouth, people trust it." Cerria became an even bigger NFL fan when the San Francisco 49ers, the Denver Broncos and the New England Patriots -- three of the four teams vying for a spot in the big game -- contacted her about potentially hosting their private parties aboard one of the yachts. "I've never been so excited about the Super Bowl in all my life," she said with a laugh. "And now I feel as if I'm invested to see which team's going to win and how their party's going to be." Last edited by JCMAN320; January 23rd, 2014 at 02:11 PM. In addition to JC, Hoboken and even East Rutherford are ramping things up. This will be good for people who are having an extended stay and won't be going to NY every day, and also people who don't want to wander too far from the stadium. Today will be the last chance for Jersey City football fans to participate in some pre-Super Bowl physical fun when the “Huddle Shuttle” makes its final stop before the big game. The NY/NJ Super Bowl Host Committee’s “Join the Huddle” mobile tour, which has been traveling to locations in New Jersey and New York in a 64 by 8-foot bus full of interactive activities, will be giving kids and adults alike looking to release some of their excitement for the last time today from 1:30 to 5:30 p.m. at the Journal Square Transportation Center at 1 Path Plaza., between Sip and Pavonia avenues. All of the many Super Bowl-themed activities and memorabilia available to attendees at the tour’s 46 previous stops, including ones in Secaucus and Jersey City, will be there. Running, jumping, throwing, and touchdown dance skills stations will give fans the opportunity to hone their skills, and even boast about their accomplishments with friends through social media with a specialized wristband scanned at each post that will record their progress for online sharing. Mementos from the Jets, Giants, Hall of Fame coach Vince Lombardi and a number of previous Super Bowls will be on display inside a replica stadium locker room on the bus. The Vince Lombardi Trophy, will receive its last round of photo opportunities in New Jersey before being awarded to the winning team on Feb. 2. After today, the bus will be parked at Super Bowl Boulevard, a massive 14-block celebration on Broadway in Manhattan, until game day. I've bee so busy running around taking part in the Stadium Series game and Pre Super Bowl festivities and have not kept up so here a few articles even though they might be a day old. Jersey City is rolling out the red carpet for the Super Bowl participants. The city, in partnership with the Hudson County Chamber of Commerce, will welcome the AFC champion Denver Broncos and NFC champion Seattle Seahawks on Sunday in separate events. The events will feature a field goal kicking contest, music, giveaways, hot chocolate, and more, will allow participants to watch as the teams make their way to their hotels in Downtown Jersey City. Children attending both events will be entered into a drawing to “serve” as deputy mayor for a day alongside Jersey City Mayor Steve Fulop. One child will be chosen from each event. Additionally, 100 Liberty Science Center passes will be distributed at the 8 p.m. Seahawks welcoming event. The Broncos welcoming event is at 4 p.m. outside the Hyatt hotel, 2 Exchange Place. The Seahawks welcoming event is at 8 p.m. outside the Westin, 479 Washington Blvd. The City raised donations for the events from Mack-Cali, the Hyatt, Newport Development Associates, the Westin, the Jersey City Medical Center and the Hudson County Chamber of Commerce. Banners along Christopher Columbus Drive will also greet the two teams as they travel from Newark-Liberty Airport to their hotels. For the next two weeks, Christopher Columbus Drive will be known as Super Bowl Drive. "We are excited to welcome the Denver Broncos and the Seattle Seahawks, as well as all of their fans, to Jersey City," Fulop said. "Working closely with the NFL has been a great opportunity to showcase Jersey City as we prepare for the nation’s largest annual sporting event. We hope that everyone attending the Super Bowl experiences everything Jersey City has to offer." Officials are sprucing up Jersey City in preparation for the arrival of the Denver Broncos late Sunday afternoon and the Seattle Seahawks later Sunday night. The two Super Bowl XLVIII teams will stay in the Westin and Hyatt hotels in Downtown Jersey City in preparation for the game on Sunday, Feb. 2, 2014. While the Denver Broncos and the Seattle Seahawks won't arrive in the area until tomorrow afternoon, Downtown Jersey City is as busy as ever. Along Columbus Drive and Washington Street, workers have begun to place large, blue banners with the Super Bowl logo on them on top of light posts to welcome the teams to Jersey City. Also looking to welcome the two Super Bowl teams, both the Hyatt and the Westin have placed banners of their own depicting images of the two teams. The Hyatt, at the foot of Columbus Drive, is decorated with images of Broncos quarterback Peyton Manning and New Jersey's own Knowshon Moreno near the entrance of the hotel. The Broncos will stay at the Hyatt starting tomorrow and through the end of the week. Not to be outdone, the Westin features images of their guests, including Seahawks quarterback Russell Wilson, running back Marshawn Lynch and cornerback Richard Sherman, outside the entrance to their hotel. Even though the teams won't arrive in Jersey City until tomorrow, security measures have already begun. Police officers have placed several barricades near both hotels in preparation of tomorrow's welcoming ceremony. In addition, the Hyatt pier has been shut down and will remain shut down until after next Sunday's big game. By Monday morning, the two columns standing outside the Hyatt Regency in Jersey City were already the right hue of Broncos blue and a nearly life-size photo of Peyton Manning covered the pillar in the building’s entryway. Starting Sunday, when the Broncos arrive, the hotel will serve as the team’s home for the next week. The Seahawks will stay at the nearby Westin, less than a mile away and a 15-minute walk. With New York and New Jersey warring to be the rightful namesake of Super Bowl XLVIII, Jersey City will serve as the actual base of Super Bowl week — a role years in the making. The city itself hopes to show off its refurbished face, while the hotels will try to make the visit as homey as possible for the two franchises. "We’ve been working on it for some time," Jersey City Mayor Steven Fulop said. "Now it’s game time for the city." The upcoming week, in some ways, will be just as important to the city as the Super Bowl will be to the two teams. Fulop wants to show that Jersey City is "one of the best midsized cities in the country," while the two hotels hope to have a smooth week housing its star tenants. The signs that the big game has come to the city will be evident all along Christopher Columbus Drive, the boulevard that bisects the city. It has been renamed Super Bowl Drive and banners will fly all along the street, creating a non-stop parade of the NFL’s presence. For the hotels, it is just as overt, starting with the blue awning atop the entrance and the large photo looking over the lobby. Along with providing housing for the week, the hotels must serve as the makeshift football facilities for the two teams — each with their own particulars and needs. In normal weeks, coaches and players spend dozens of hours at their facilities, preparing for opponents, mending injuries and chattering away through team meals and in the locker room. This week, the Seahawks will have the use of the Giants’ building in East Rutherford and the Broncos will use the Jets’ facility in Florham Park, but the hotels will also provide facilities. When Seattle’s liaison arrived Tuesday to begin preparations for the team’s appearance, he gave the Westin a quarter-inch thick booklet with the desired specifications and expectations, said Colleen Senters, the hotel’s general manager. The Seahawks will take up 120 to 150 of the building’s 429 rooms. The Broncos will take up approximately 150 of the Hyatt’s 351 rooms until Wednesday night, when they will then have full run of the hotel. In the Westin, some rooms will be made into training rooms and massage rooms, with the pool area also used for the team. It will provide the team with projectors and screens, through an AV company, to watch films. The Broncos will make use of all 20,000 square feet of the Hyatt’s meeting and conference space. Just as important will be the food. The hotels will be warehouses for the week, with each team providing its own preferences for team meals. The Seahawks will fly in their own food. "They’re very health conscious," Senters said. "They’re very into super-food." The Broncos gave the Hyatt their requested menus, most of which will not differ from the hotel’s usual fare, general manger Terry Dunbar said, though macaroni and cheese will be a new addition. The team also specified its beverages and the Hyatt will be well-stocked in water, Gatorade and Coors. But most of the time, Dunbar says, has been spent on security. No shortage of personnel have been given walkthroughs of the hotel, which sits on the waterfront and is adjacent to the Exchange Place PATH station. The Westin is two blocks away from the Newport Mall and its PATH station stop, with the Seahawks bringing in their own security personnel for the week. Fulop says about a dozen different law enforcement agencies and the NFL have been involved in the security process. They have run different types of emergency management drills, preparing for responses to cold weather, broken water mains and even terrorist attacks. Jersey City police will be deployed in a modified pattern this week, ensuring the hotels are safe and that the teams can get to their practices — but without neglecting other parts of the city. And there are the NFL’s demands. Jersey City worked with the league to make sure that no organization could profit off the sea of press and commercial attention by running a guerilla marketing scheme. The city’s financial hopes are also riding on the week. Fulop is a Giants fan and when the team began the season with five consecutive losses, he quickly turned his Super Bowl hopes to teams that would bring the most rabid fans from as far away as possible — who could spend the most money. It is all part of Fulop’s vision to sell the city. Several days ago, Jersey City sent out a request for proposals for a branding and marketing campaign, with a willingness to spend upwards of $600,000 on the operation. This upcoming week, however, may just serve as its own advertisement for the city. JERSEY CITY — Not even the 28-degree temperature or icy wind whipping off New York Harbor could keep the brave from tonight’s Super Bowl Kickoff Spectacular at Liberty State Park, New Jersey’s first major NFL event for game week. “Here’s a hand warmer,” said Johnny Rzeznik, frontman of the Goo Goo Dolls, throwing a packet at the crowd. The band played a warmup before the show went live on Fox Sports 1. Acknowledging the frigid temperature, the NY/NJ Super Bowl Host Committee had the warmers and earmuffs on hand for concert guests. “Let’s do this again, next time in July,” Rzeznik said as he left the stage, bundled up in a peacoat. The crowd guffawed, gripping the hand warmers underneath their gloves, breath visible in front of frozen faces. Another band, Daughtry, opened the live telecast, after a series of NFL clips chronicled the stars of the Denver Broncos and Seattle Seahawks, quarterback Peyton Manning and cornerback Richard Sherman. Gov. Chris Christie appeared briefly on stage with New York Mayor Bill de Blasio, Al Kelly, chair of the host committee, and Giants co-owner John Mara. Also there — the Tisch family and Jets owner Woody Johnson. Fox hosts Joe Buck and Erin Andrews emceed the event, Andrews grimacing at the brisk chill as the show went live. The Fray, from Denver, performs at the Jersey City kickoff show. “It’s great, especially for Jersey,” said Billy Laing, who made the trip to the concert from Manalapan. “It’s shame more people didn’t come,” said Joellen Racioppo of Jersey City, attributing the sometimes thin audience to the harsh weather. The concert and fireworks show, announced Jan. 16, sold out within hours. When additional tickets were released, the show sold out again. Most tickets were free. For $40, VIP tickets (also sold out) offered entry to a “warming station” in the Maritime Parc restaurant. There, members of the host committee, Macy’s employees and some concertgoers soaked up as much heat as they could, while munching on plates of sliders and macaroni and cheese, before diving back into the cold. One of the night’s headliners, The Fray, hails from Denver, having played halftime during the last championship game. “I’m an AFC fan,” said Schmittler, so he’ll also be rooting for the Broncos on Sunday. Angela Decillis, of the Iselin section of Woodbridge, came for one of her favorite bands. “I’d pay a million dollars to see Daughtry,” she said, sitting in the warming area at Maritime Parc. 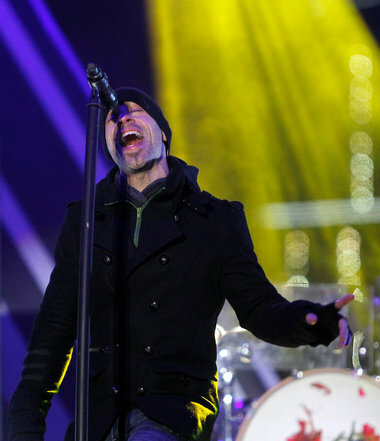 Chris Daughtry, frontman for Daughtry, at the kickoff concert. “I saw it on Facebook and I was like, ‘Let’s go,’” said her husband, Matt. They even spotted Mara in the restaurant. “It must be the real VIP upstairs,” Angela said. The Marra family of Secaucus — with a second “R” and no relation to Mara — came because “it was something different to do,” said Carol Marra. The fireworks closed out the concert, a kind of shortened, wintertime version of the yearly Fourth of July Macy’s show with ample viewing space for all. Booming across the winter sky, red, green, blue and purple shimmered on office buildings before the crowd rushed to their cars, ditching hand warmers to hop buses back to parking lots. "The cover says New York/New Jersey at the bottom of the photo. The photo, taken at the top of Rockefeller Center, includes Jersey City. It shows part of the NYC skyline looking across the Hudson River (which borders both NJ and NYC) to Jersey City, where both Super Bowl teams are staying. 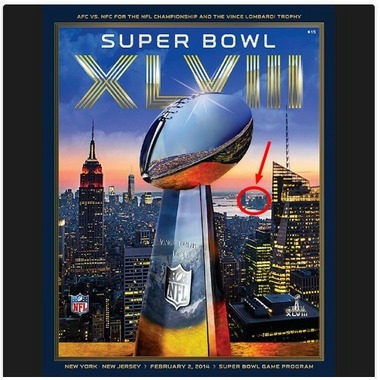 The Super Bowl logo is a reverse view. It is the stadium in New Jersey with elements of the NYC skyline in the background." Also note what Giants owner John Mara said before the cover was released, via The Star-Ledger's Dave Hutchinson: "[New York and New Jersey] cooperated with each other very nicely. Certainly, making sure New Jersey doesn't get left in the cold is a challenge for us. We certainly want the state of New Jersey to feel like they’re a huge part of this game because they are." Readers: Do you still think it's a Super Snub? Last edited by JCMAN320; January 31st, 2014 at 12:05 AM. How would authorities and law enforcement officials respond if a major snowstorm hit Jersey City during the Super Bowl? What about a terrorist attack? These scenarios were played out this morning at a Super Bowl preparedness exercise in the command center of Jersey City's Office of Emergency Management. The exercise was attended by, among others, Jersey City Mayor Steve Fulop, Deputy Police Chief Joseph Connors, Public Safety Director James Shea, OEM Director Sgt. Greg Kierce, heads of multiple city agencies and FBI supervisory Special Agent Michael D'Alonzo. "The point of these exercises is to bring everyone together ... it identifies who's going to do what," Shea said. "It's so we're not meeting each other for the first time at the scene." In a major snowstorm scenario played out today, a blizzard warning is issued for Hudson County, and the National Weather Service predicts 20 to 30 inches of snow. Water main breaks then interrupt water service to Newport Downtown, where the Super Bowl teams will be staying, and power outages affect various parts of the city. A United Water official responds with backup water being provided within an hour and repair crews get to work on the breaks right away. An official from the Department of Health and Human Services sets up warming stations for the homeless and coordinates with homeless shelters in the area. In the terrorist scenario, two men are spotted jamming a suspicious package under a table at a restaurant at the Westin in Jersey City, where one of the Super Bowl teams is staying. They then leave quickly. Authorities confirm the package is suspicious, the hotel is evacuated and a bomb squad gets on site within minutes to investigate. Security at the Hyatt, where the other Super Bowl team is staying, is increased. In the meantime, the two men are tracked down by Port Authority police, where one is shot when he refuses to remove his hands from his jacket and the other is apprehended. The FBI probe their cell phones to find who the men have been talking to; the bomb squad at the Westin finds out the package is a bomb and defuses it, and another man with a suspicious package is seen approaching the Hyatt and arrested. A bomb squad finds out the second package is also a bomb, and the FBI, after realizing that the attack has connections with Pakistan, works with Jersey City police and other law enforcement agencies to track down any other suspects and foil any other planned attacks. After the two scenarios were played out, Shea said Jersey City is well-prepared for any emergency that might occur during the Super Bowl. "We will have all the resources we need," he said. "We've been practicing for two years." "There are going to be hundreds of thousands of people in Jersey City. There will be billions around the world watching the Super Bowl," Fulop said. "We want to make sure we're as ready as possible. It's important to do these things." Jersey City Mayor Steve Fulop is making the rounds as the media focuses its attention on New Jersey, home of Super Bowl XLVIII. Fulop, 36, told Brian Lehrer on WNYC yesterday that it would take a "significant" weather event for the game date to be moved from Sunday. Jersey City has been preparing for the game for two years and wants it to happen as scheduled, the mayor said. "It is a tax on our resources to some degree," he said. The police presence alone will cost city taxpayers several hundred thousand dollars, Fulop said, adding that he thinks the economic benefit will be worth it. "I feel this is a great thing for the city," he said. "I wouldn't change a single thing." Fulop also touched on his recent spat with Gov. Chris Christie, which became public after leaked emails revealed that Christie allies view Fulop as an enemy. Fulop told Lehrer that he's turned down requests to appear on Meet the Press and Anderson Cooper's CNN show to discuss the governor. "If you don't have something nice to say about somebody, you don't say anything," he said. Meanwhile, on WCBS 880, Fulop told host Steve Scott that nearly every hotel in Downtown Jersey City is full or almost full because of the Super Bowl teams and fans. Like on Lehrer's show, Fulop recounted to Scott meeting Denver Broncos operations boss John Elway on Sunday when the team arrived in Jersey City. Elway thought the mayor was just a fan seeking an autograph. "Funny, but awkward," Fulop said. ^Among other emergency measures, two F16s circling the area during the game. Imagine all the stuff going on that we don't hear about. Would be interesting to see how much JC and the surrounding NJ towns took in this week. Let's cut to the chase. Worst. Superbowl. Ever.